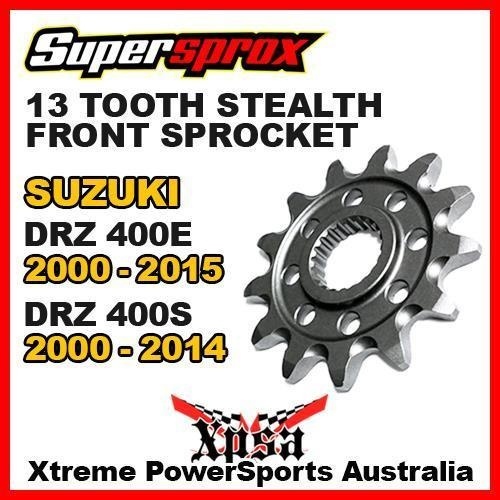 SUPERSPROX FRONT SPROCKET 16T SUZUKI DRZ 400SM DRZ400SM SUPERMOTO 2006-2015 MX You are purchasing: Supersprox 13 Tooth Front Sprocket Stealth (10S-143-13) Supersprox Front Chain-wheels will last longer than the competition because of their case-hardened core refined #432 Chrome-Molybdenum steel. 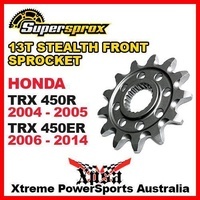 A super hard outer layer gives unrivalled wear life, whilst the tough core ensures this sprocket will take all riding conditions in its stride. Machined lightening holes give a balance of weight without compromising strength. 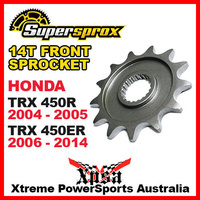 Designed to work best with Supersprox rear sprockets, DID, RK and Regina chains. 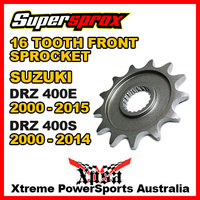 Suits: SUZUKI DRZ 400E Years 2000-2015 DRZ 400S Years 2000-2014 Specifications: Supersprox front chain-wheels are the best front chain-wheel on the market today. CNC machined to precision tolerances. Using a special Nickel-Chrome 432 steel, case hardened core refined to give the ultimate combination of strength and hardness. 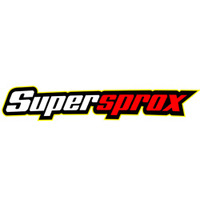 Self cleaning dirt grooves on off-road applications. Lightweight design for the ultimate performance.